Love him or loathe him, former Malaysian Prime Minister Tun Dr. Mahathir Mohamad still draws attention wherever he goes. 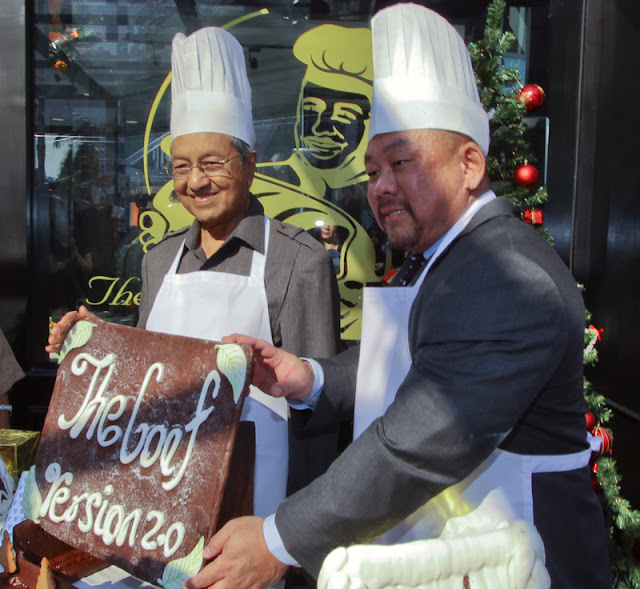 At the recent launch of the new flagship outlet of Malaysia’s premium Japanese-inspired bakery The Loaf at the Pavilion Kuala Lumpur, he drove the crowd into a frenzy when he appeared at the outdoor patio. Watching him affably shaking hands with locals and tourists while others snapped feverishly away with their smartphones, there was no doubt that his magnetic personality hasn't dimmed an iota. For once, I was the early bird who snagged one of the best seats in the house...well among the papparazzi anyway ;D to witness Tun M and The Loaf managing director, Jiro Suzuki unveiling a gingerbread plaque to mark the outlet's relaunch. Opened in 2007, The Loaf at the Pavilion Kuala Lumpur now boasts a new ‘baked-to-order’ concept - a menu that showcases and delivers oven-fresh bakery items by The Loaf’s master bakers to their table fresh from the kitchen. As chairman of The Loaf, Tun M said: “The premium bakery market is becoming increasingly competitive and it was time to reinvigorate our flagship outlet. We have introduced full waiter service in our café/restaurant while maintaining a self-service counter within the shopping centre entrance. Diners will find about 20 varieties of creative breads in the line-up including breads with spicier toppings, Middle Eastern-influenced ones and assorted doughnuts with sweet toppings in addition to its regular Japanese-styled bread and pastry items. The Loaf opened at the picturesque Langkawi’s Telaga Harbour Park in 2006 and has since expanded to include outlets at the Empire Shoppng Gallery Subang Jaya, IOI Boulevard Puchong, Bangsar Village II, Tokyo Street The Pavilion Level 6, The Mines, Great Eastern Mall, Paradigm Mall Kelana Jaya and in Pantai Cenang, Langkawi. It was former restaurateur, entepreneur and founder of YEAST Christophe Chatron-Michaud's search for good French breads to satisfy his cravings that led him and wife/MD Lissan Teh to open YEAST, Bangsar's latest French boulangerie (bakery), bistro and wine bar. Roping in artisan baker Christophe Gros all the way from France to produce traditional, rustic French breads using home-grown, natural yeast starter at their new venture, YEAST believes it will win discerning foodies over with their Bistronomy (Bistro + Gastronomy geddit?) concept. You can't miss its bright sunny yellow facade that beckons invitingly to passersby to pop in and browse. Imagine the wonderful scent of freshly baked breads wafting out its typically French premise (sepia-toned posters, black&white floor tiles and cosy red banquette seating) every morning - yes, at the unearthly hours of 4 am whilst most of us are still cavorting with Mr Sandman, the artisan baker is already hard at work preparing our daily bread! YEAST is ready to show how we can rustle up different meals from its wide variety of signature breads; from appetiser and starter to dessert too. Chatron-Michaud is even dabbling with the exciting possibility of pairing his hearty, crusty breads with local curries, spreads and fillings. Priced from RM10 onwards, YEAST's signature breads include the traditional baguette, flaky crescents of croissants, gruyere cheese and smoked duck batard, cranberru batard and white chocoalate viennois. Toasted lightly and spread with just a little butter, they're perfect for a simple but tasty breakfast. Come noon, roll up your sleeves for a speedy yet delicious lunch of smoked salmon sandwich, Nicoise salad or a slice of quiche Lorraine washed down with some roasted pumpkin soup with duck confit. Tea calls for puffy croissants adorned with almond flakes, wickedly sinful Valrhona chocolate tart, warm almond and pear tart or the refreshingly tangy lemon meringue tart. As the day turns dusky at sunset, you can seek solace in a bowlful of comforting boeuf bourguignon (tender braised beef short rib with red wine, root vegetable puree and crispy fried onion) or delicately seared salmon with creamed spinach and bearnaise sauce. Complement a glass of your favourite red or white wine (French of course!) with duck liver terrine with port-balsamic and fruit reduction on brioche toast or king prawns in puff pastry with tarragon-fennel bisque and ratatouille. Deeply flavourful yet light enough to keep growling tummies amply filled. "Forget about stuffy rituals of French dining," urged Chatron-Michaud. "YEAST's convivial atmosphere welcomes you to discover the pleasures of classic comfort food that's freshly cooked right in our open kitchen." YEAST seats up to 60 persons and will be opened Tues-Sun from 8 am to 6 pm. Bistro dinner menu available after 5 December 2012. Ample proof that men and women can live on breads alone...especially if they're oven-fresh from YEAST. Some of us may never get a chance to be one of those tycoons to make the Forbes rich list but hey, we can sure dine like the best of them! 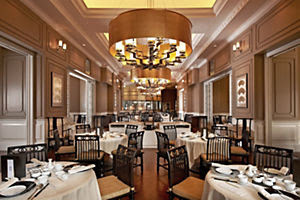 With its pristine white high ceiling and ornate chandeliers, expansive picture windows and polished marble-topped tables paired with Blackwood chairs, carefully curated Oriental artworks and artefacts, the Mandarin Oriental Kuala Lumpur's world-class Chinese restaurant would immediately make any mogul worth his millions feel right at home. Now that award-winning chef Ricky Thein has taken over the culinary reins, you can expect the food to be suitably refined and palate-pleasing enough to satisfy those of the manor born. No faddish food here thank you very much. Instead the chef's latest repertoire harks back to familiar, well-loved classics that are bestowed with restrained modern touches. Portions may look deceptively dainty but rest assured, the resultant flavours are anything but. Bold yes; brash no. Take that night's curtain-raiser for instance. The visually arresting platter has two delicate egg pancake cones stuck upright into discs of fresh watermelon and musk melon. Filled with crispy seven spice-scented soft shell crab chunks, they form a pretty picture with a scattering of tiny, translucent ginger flavoured jelly dices on the side. Mind you, those little cubes sure worked like a charm, their zingy bursts of warm spiciness adroitly tempering the crustaceans' mild greasiness. For someone who never care much for soup, I always make an exception for Chef Ricky's soulful broths. I still recall the splendid soup he dished up for the recent Malaysia International Gourmet Festival and this time, it was no different. The doubled-boiled soup with baby abalone and supreme fish maw was good to every sweet, last drop. Aside from the little baby bok choy, slippery smooth fish maw and luxurious baby abalone, its delicate sweetness was augmented by berry-bright red kei chi (wolfberries) and a whole dried scallop. Bursting with deliciously smoky accent from its jasmine tea-smoked preparation, the tender, juicy chicken had everyone clucking with approval. The bracing ginger and spring onion dip gave it a sublime lift. While most chefs would prefer to counter the cod's natural richness with something acidic, Chef Ricky took a gamble by topping rectangular bars of black cod fillet with gooey, melted cheese. Accompanied by fat spears of Australian asparagus tips, crunchy magnolia petals and crisp-tender deep-fried shimeiji, we felt like the proverbial cat that got the cream. I guess the trick is to slap on just enough to tantalise the tastebuds or else it'd be too much of an overkill. The lightly stir-fried, jade green snow peas, celery, carrot and asparagus stalks in the ensuing dish of Stir-fried Seasonal Vegetables with Honey and Crispy Preserved Olive Tree Leaves helped to alleviate the guilt of such an indulgent treat somewhat. Alas, before we could pat ourselves on the back for being such saints, our steely resolve disappeared instantly the minute we had a bite of the seared prawns with spicy lemongrass sauce. Those succulent crustaceans lacquered in a fiery piquant and citrusy sauce with aromatic curry leaves, onion and garlic slivers would draw even the wiliest, cold-fish magnates out of their shell. Why bother sending a private jet to buy a plane-load of Musang King durians when you can waltz into Lai Poh Heen and demand a serving of the famed chilled durian pancakes? Meticulously wrapped to resemble pale gold ingots filled with cool, creamy and oh-so-heavenly sweet filling, every mouthful of the pancake is sure to leave you feeling like a million dollars. And that, ladies and gentlemen, are some of the alluring ways to tempt a tycoon...or dine like you're one!